Class for objects that represent moving frames in space and that contain ChVariables proxies to the solver. Copy constructor, build from another moving frame. Assignment operator: copy from another moving frame. Assignment operator: copy from another frame. Returns true for identical frames. Returns true for different frames. Performs pre-multiplication of this frame by another frame, for example: A>>=T means A'=T*A ; or A'=A >> T.
Performs post-multiplication of this frame by another frame, for example: A*=T means A'=A*T ; or A'=T >> A. Return both current rotation and translation speeds as a coordsystem object, with vector and quaternion. Return both current rotation and translation accelerations as a coordsystem object, with vector and quaternion. Return the current speed as a 3d vector. Return the current acceleration as a 3d vector. Return the current rotation speed as a quaternion. Return the current rotation acceleration as a quaternion. Computes the time derivative of rotation matrix, mAdt. Computes the 2nd time derivative of rotation matrix, mAdtdt. Returns true if coordsys is identical to other coordsys. Returns true if coordsys is equal to other coordsys, within a tolerance 'tol'. Construct from position mv and rotation of angle alpha around unit vector mu. Copy constructor, build from another frame. Return both current rotation and translation as a coordsystem object, with vector and quaternion. Return the current translation as a 3d vector. Return the current rotation as a quaternion. Return the current rotation as a 3x3 matrix. Get axis of finite rotation, in parent space. Get angle of rotation about axis of finite rotation. Apply both translation and rotation, assuming both expressed in parent coordinates, as a vector for translation and quaternion for rotation,. Normalize the rotation, so that quaternion has unit length. Sets to no translation and no rotation. Fills a 3x4 matrix [Fp(q)], as in [Fp(q)]*[Fm(q)]' = [A(q)]. Fills a 3x4 matrix [Fm(q)], as in [Fp(q)]*[Fm(q)]' = [A(q)]. Rotation and position speed, as vector+quaternion. Rotation and position acceleration, as vector+quaternion. Rotation and position, as vector+quaternion. Transform generic cartesian force into absolute force+torque applied to body COG. If local=1, force & application point are intended as expressed in local coordinates, if =0, in absolute. Transform generic cartesian torque into absolute torque applied to body COG. If local=1, torque is intended as expressed in local coordinates, if =0, in absolute. Returns reference to the encapsulated ChVariablesBody, representing body variables (pos, speed or accel. see VariablesLoad...() ) and forces. The ChVariablesBodyOwnMass is the interface to the system solver. 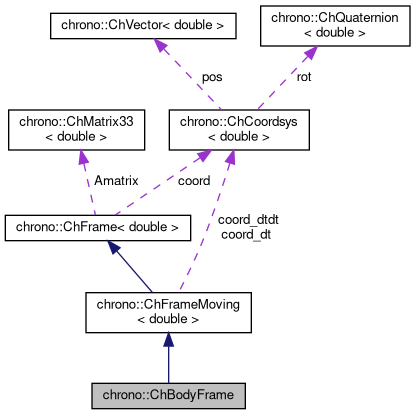 Implemented in chrono::ChBody, and chrono::fea::ChNodeFEAxyzrot. Generated on Tue Apr 23 2019 05:38:57 for Project Chrono by 1.8.9 .